Inventory We are a resale marketplace, not a box office or venue. Ticket prices may exceed face value. This site is not owned by Fox Theater Detroit . You may have seen the Fox Theatre Detroit in the latest Chrysler commercial during the Super Bowl featuring Eminem and the Chrysler 200. But the Fox Theatre has been around for years. The Detroit Fox is one of five spectacular Fox Theatres built in the late 1920s by film pioneer William Fox. (The others were the Fox Theatres in Brooklyn, Atlanta, St. Louis, and San Francisco.) It was designed by architect C. Howard Crane with a lavish interior featuring a blend of Burmese, Chinese, Indian and Persian motifs. There are three levels of seating, the Main Floor above the orchestra pit, the Mezzanine, and the Gallery (balcony). The exterior of the attached 10-story office building features a facade with Asian motifs which, when illuminated at night, can be seen for several blocks. The Fox Theatre in St. Louis, Missouri is (on the interior) its architectural "near" twin with about 500 fewer seats. 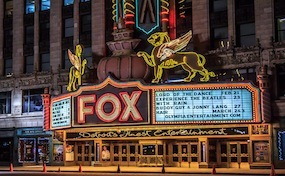 The Detroit Fox is part of the Fox Building, while the St. Louis Fox is a stand-alone theatre. The architectural plaster molds of the slightly older (1928) Detroit Fox were re-used on the later (1929) St. Louis Fox. TheaterDetroit.com is a privately held company that specializes in the sale of tickets in the secondary market. We are not affiliated with any official supplier or box office. To purchase tickets to any Fox Theatre Detroit events simply call our operators at anytime or click on the event you wish to attend.